Pumpkin Doughnuts with Maple Glaze combine two favorite Fall flavors, perfect for an Autumn breakfast, sweet afternoon snack, or scrumptious dessert. Are you that person that spells it “doughnuts” or “donuts”? I am the former, that’s just how I have always spelled it, except when referring to that famous donut chain. There is nothing like freshly made doughnuts on a weekend morning with a good cup of coffee. 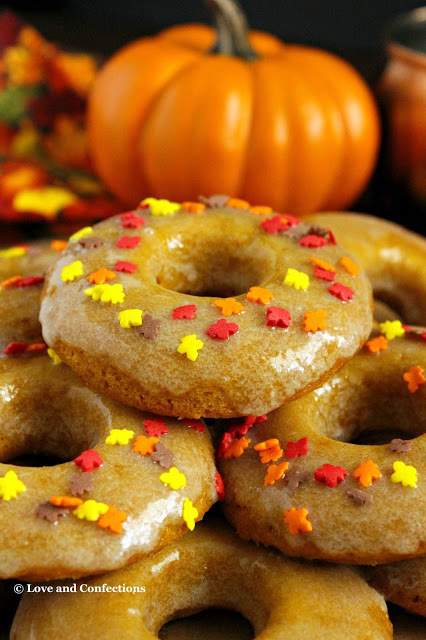 Pumpkin doughnuts with maple glaze have me longing for the weekend and wanting to curl up with a blanket, good book, and cup of coffee! 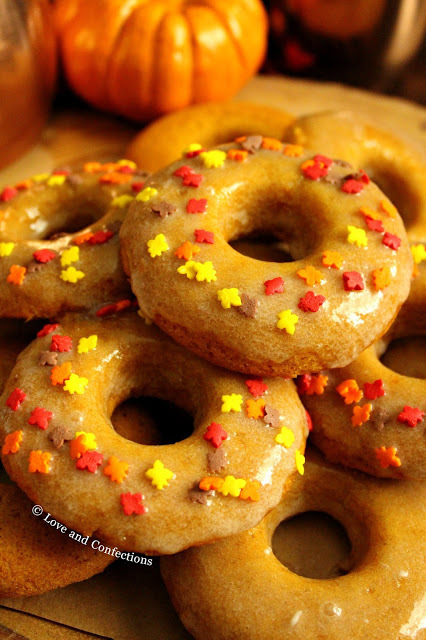 My favorite are yeast doughnuts – usually Boston cream and chocolate frosted. I have a love-hate relationship with cake doughnuts, though. Most of it comes from having dry doughnuts that don’t have taste. These pumpkin doughnuts are definitely not dry and are packed full of flavor. My only qualm is that sometimes cake doughnuts bake up a little flat. I am still tweaking recipes to try and get fluffy, delicious baked doughnuts. I didn’t want the glaze to be too think, and thinned it out a bit. It’s a personal preference how you like your doughnut frosted. I will probably try a little thicker glaze next time. You could even try a chocolate ganache. 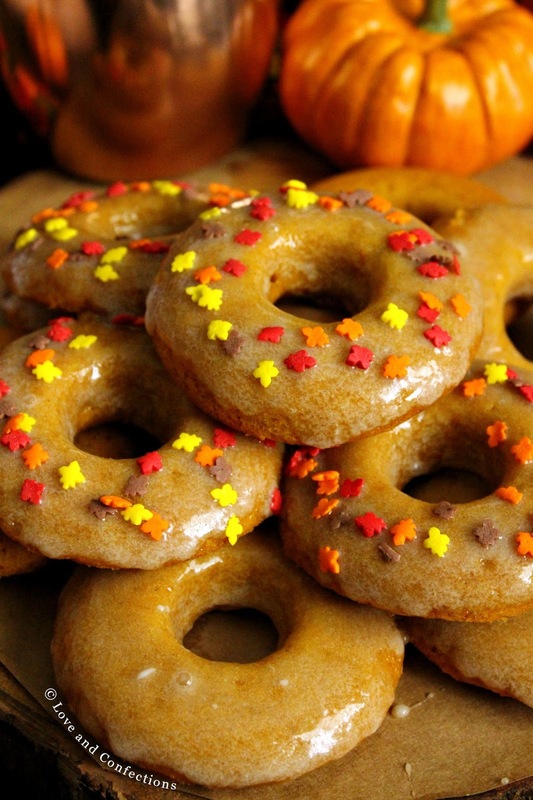 Pumpkin and chocolate are a great combination. Heat oven to 350F. Grease doughnut pans. Sift powdered sugar into medium mixing bowl. Add butter, maple syrup, and milk (1 teaspoon at a time) and whisk until desired consistency. Dip doughnuts and place on cooling rack for excess glaze to drip off. Bacon Pumpkin Waffles from Caroline’s Cooking. Pumpkin Lasagna from A Day in the Life on the Farm. Pumpkin Pie Hummus from Mildly Meandering. Pumpkin Polenta from Cindy’s Recipes and Writings. Savory Pumpkin Bread from Rants From My Crazy Kitchen. Bourbon Caramel Pumpkin Roll from The Crumby Kitchen. Old-Fashioned Pumpkin Bread from Palatable Pastime. Pumpkin Casserole with Roasted Marshmallows from Daily Dish Recipes. 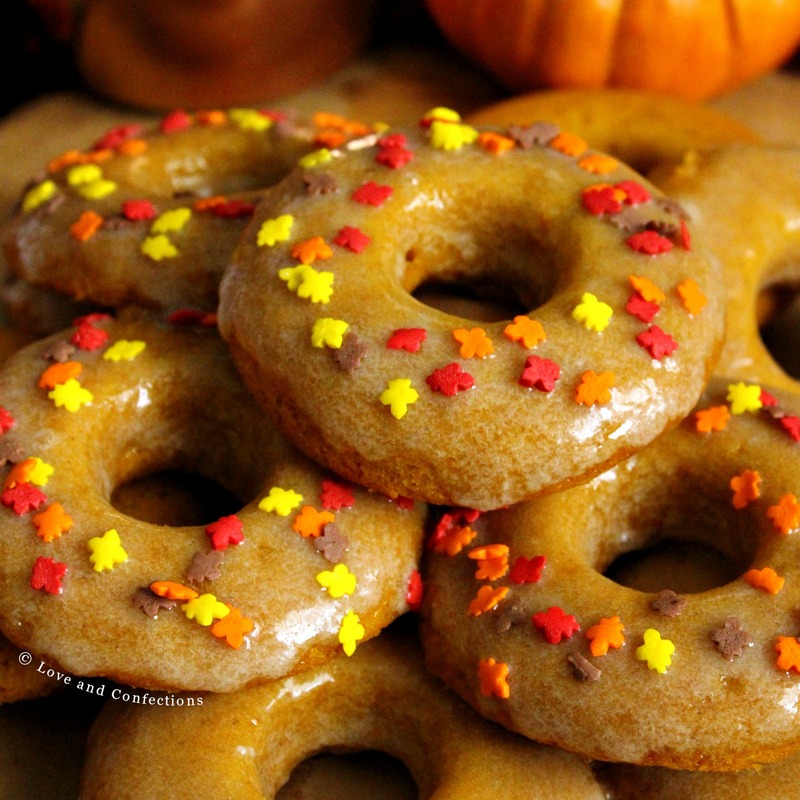 Pumpkin Cinnamon Rolls from Cookaholic Wife. Pumpkin Cookies from Making Miracles. These look amazing Terri. I need to get a donut pan.